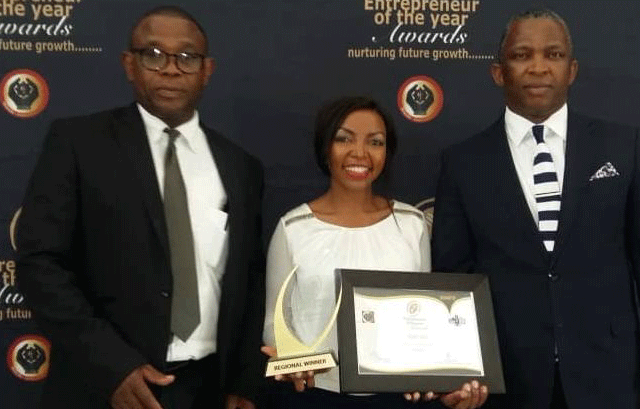 THERE is no doubt that the re-cently-crowned Hhohho Entrepre-neur of the Year Award (EYA) winner Sindisiwe Simelane, the owner of Café 360 Restaurant in the New Mall in Mbabane, is a woman of many talents. Simelane was crowned Hhohho EYA regional winner last week in an awards ceremony held in Pigg’s Peak, where she outshined several other contestants to scoop the region’s most coveted award. In an interview with the Business Desk, Simelane said Cafe 360 was started in 2016 when it first opened at the Mbabane Main Post Office behind the post boxes. “Our next stop was operating the canteen at the new Real Image building, the operation was also open to the public, which helped more people get to know our brand,” she said. It was in January last year that the Café 360 restaurant was opened at the New Mall. Winning the regional award has motivated Simelane to contest in the national EYAs. Apart from Café 360 and operating the SRA tender, Simelane also co-operates the Mugg and Bean eatery at The Gables Galleria with her sisters. She has also been involved in consulting work in food safety management systems and strategy related work. She said the secret to her success in business thus far had been living daily up to these values: Respect, honesty, integrity and service delivery. Café 360’s tag line is: #Great Food #Great Service # Great Atmosphere. The ever-ambitious Café 360 owner sees the business growing and spreading to other parts of the country and beyond borders in the next five years. When quizzed on how she survives in business amid the country’s tough economic position, she said: “The economy has been tough, particularly in 2018. We survived by ensuring that we maintained consistency in our product quality and service delivery to retain our customers who; in turn vouch for our brand, thereby opening doors for us to access new opportunities and meet new customers”. Her advice to other entrepreneurs is: "Always deliver and over deliver on the service you have promised". The EYA competition was started by the ministry of commerce, industry and trade in 2002 with the aim of encouraging and promoting a spirit of entrepreneurship and competitiveness among SMEs in Eswatini. Speaking during the Hhohho EYA awards ceremony, Minister of Commerce, Industry and Trade Manqoba Mabuza, who was represented by the Minister of Agriculture Jabulani Mabuza said through EYA, the ministry strives to uncover exceptional businesses that have demonstrated outstanding leadership and innovativeness in their business ventures. In its 16th edition this year, this competition has recorded a 35 per cent increase in the number of applicants.